During breakfast the boys wanted to discuss a wedding we are attending tomorrow. Tim says: "I hope they don't try to kiss on their mouths. That's how you spread germs. He puts his germs in her and she gives germs to him and then they're both sick." Nathan says, "I don't need kisses. I'm just a little boy." I had a hard time keeping the coffee inside my mouth :) The boys have had about all of the colds and flu they can handle this past winter and have come a bit wary of anything that may cause germs. Here is a fun little project I was working on over the weekend. 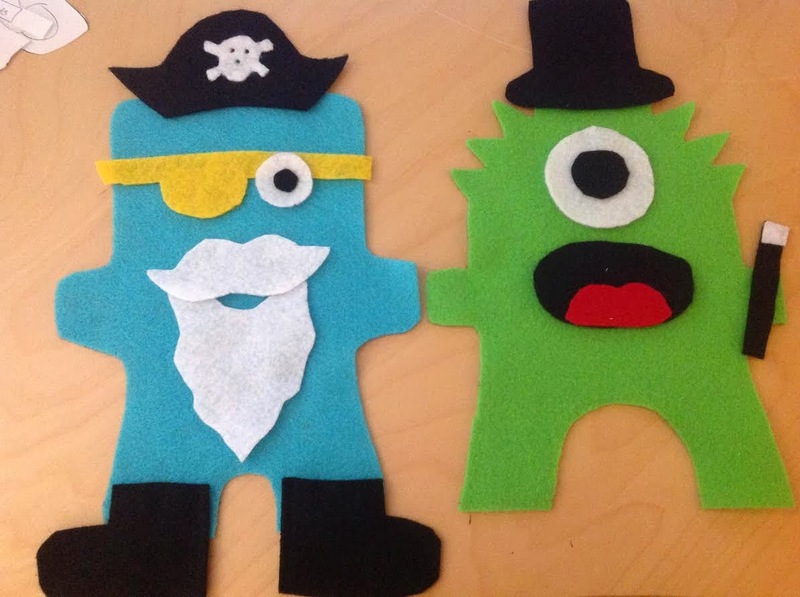 A Make your own Monster kit! I haven't decided if I'm going to stitch them into a quiet book yet but that is definitely a possibility. 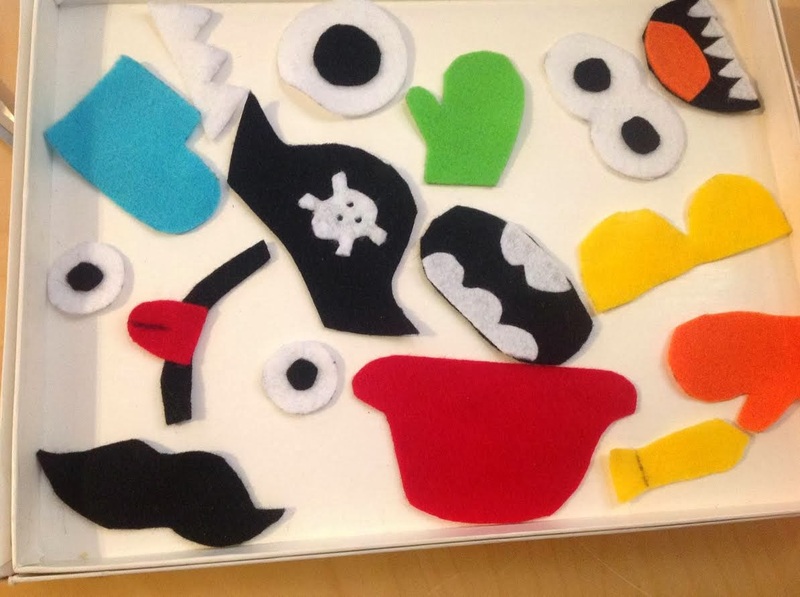 Felt sheets cost 25 cents so this was a really cheap project and it only took me two evenings to do. We had to make a magician outfit like Grandpa Nick's when he does his shows. 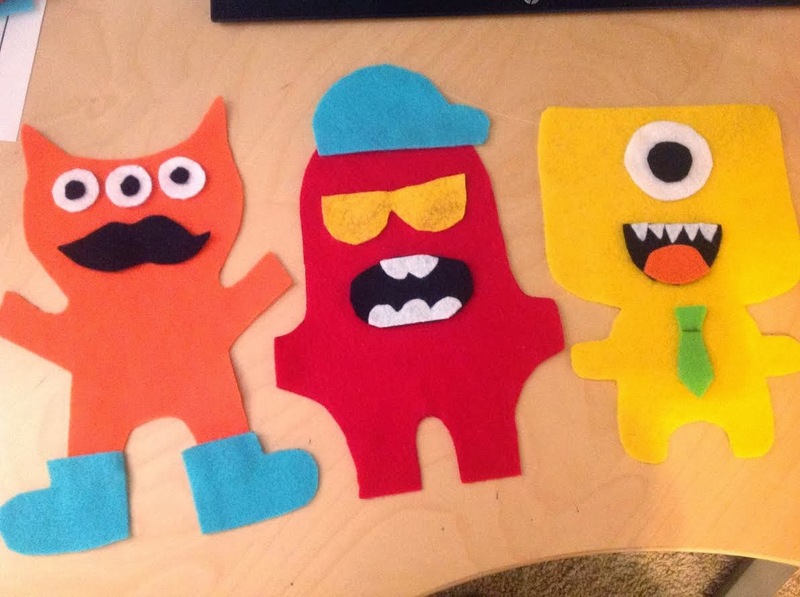 The boys are asking me to make robot parts and pieces next! I didn't use any template for the parts and accessories...just looked at images online and went for it. 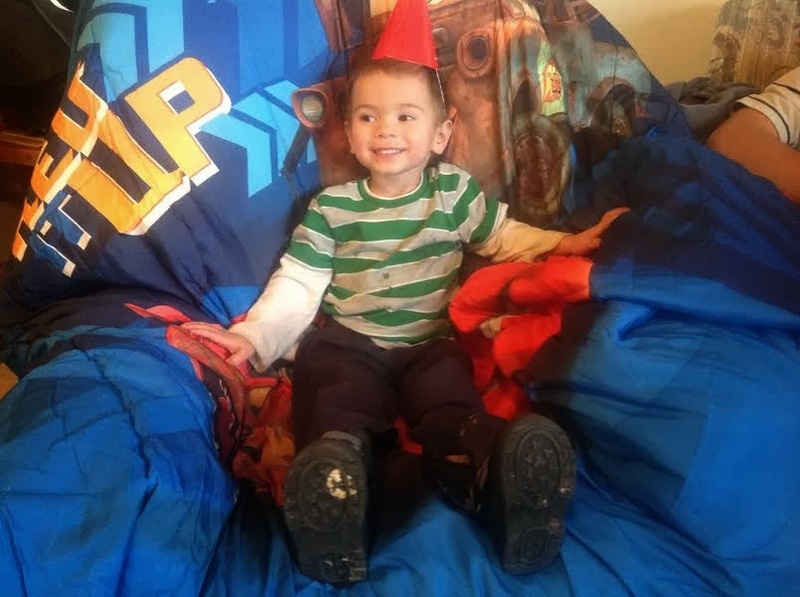 Another birthday this month- Nathan turned three! 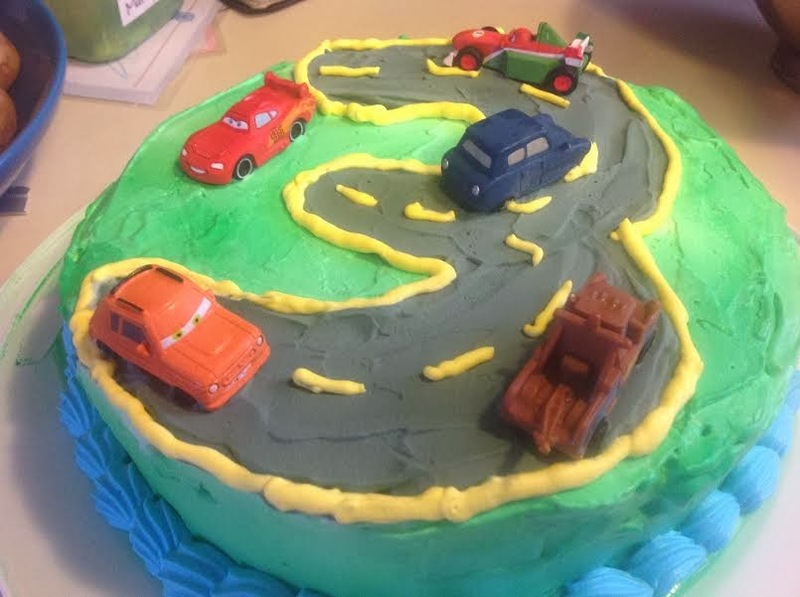 He wanted a race car themed cake. 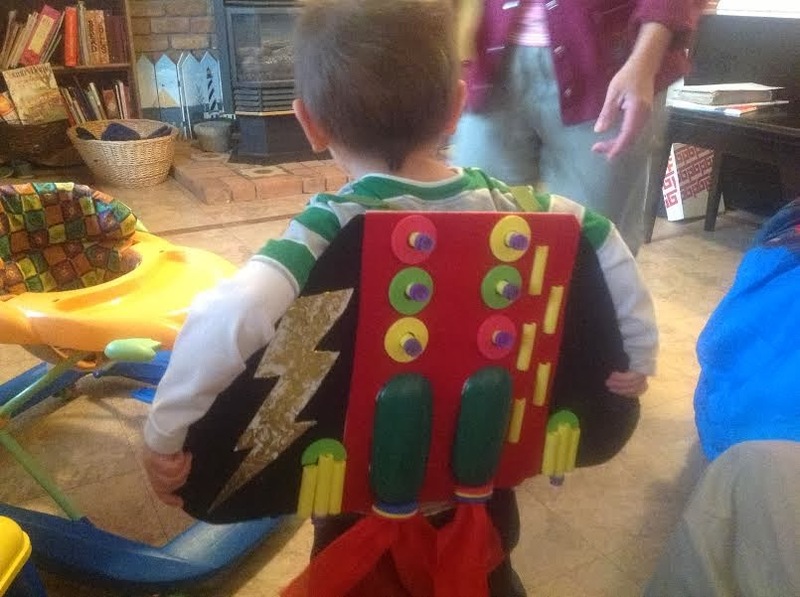 Nathan kept saying that he wanted a jet pack with fake fire and lots of buttons for his birthday. Nana made him one because you can't really find those in the store! We got him race car bedding for his "new" bunk bed...which he is still in love with. Madeline cut her first two teeth finally! I was beginning to wonder if she was that grumpy by nature! 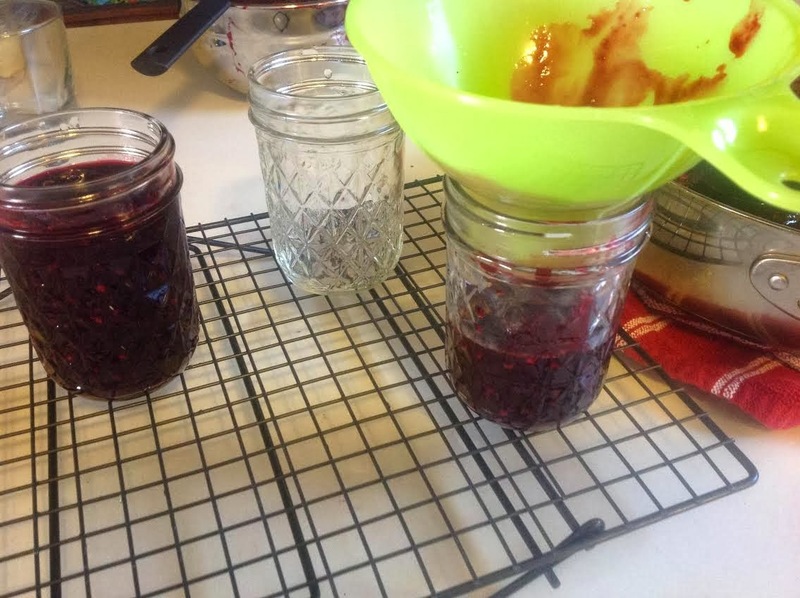 I made jam for the first time. 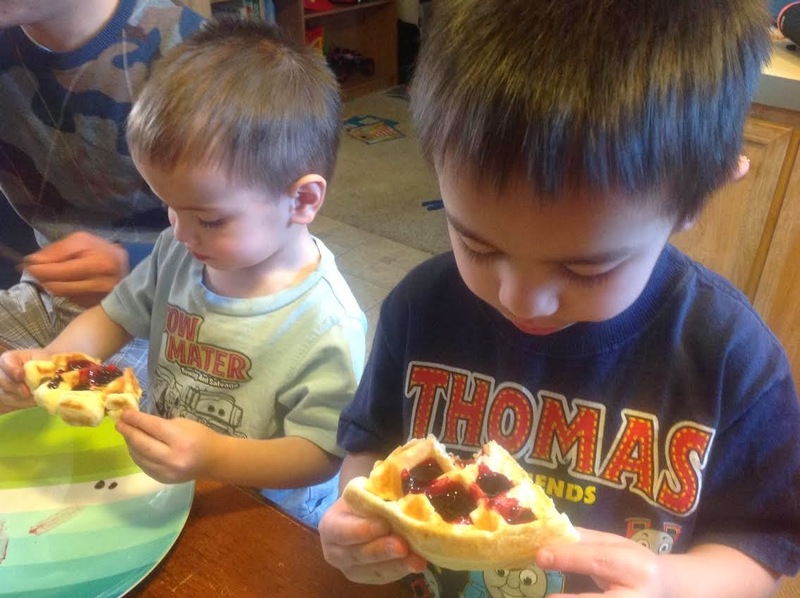 It was a lot of fun to do and we've enjoyed eating the rewards on waffles and toast in the mornings. 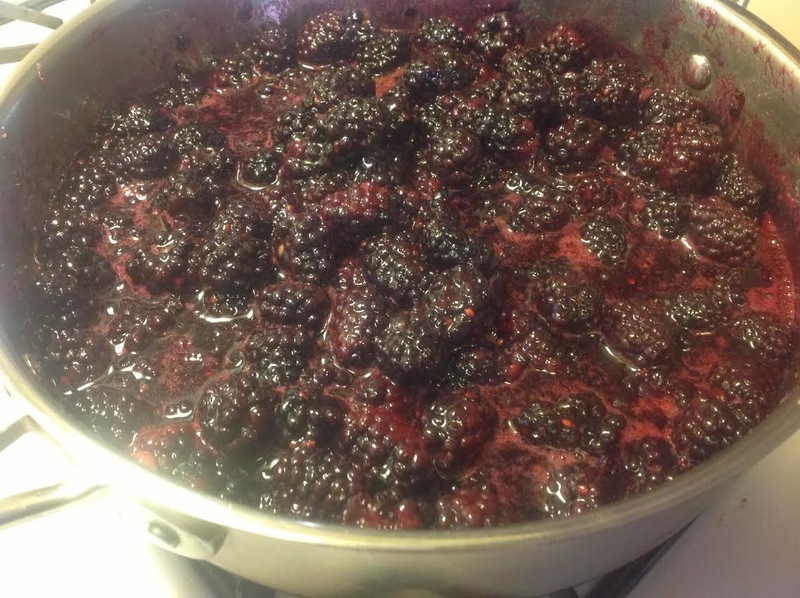 Oh, it's blackberry, in case you couldn't tell. School is still going well. We took a short trip to visit friends and family a while back and headed home with a box of books from each home. Then last week another friend gave us a dozen more books. It was all a big blessing since I'm not able to get over to the library as often as I would like now that Matt works away from home. So we have lots of new books to read and discuss- and keep! Luke 10:38-42 Now it came to pass, as they went, that he entered into a certain village: and a certain woman named Martha received him into her house. And she had a sister called Mary, which also sat at Jesus' feet, and heard his word. But Martha was cumbered about much serving, and came to him, and said, Lord, dost thou not care that my sister hath left me to serve alone? bid her therefore that she help me. And Jesus answered and said unto her, Martha, Martha, thou art careful and troubled about many things:But one thing is needful: and Mary hath chosen that good part, which shall not be taken away from her. This is a portion of scripture that I have been mulling over for months, and trying to put into practice. Focusing on the things that are truly needful. Things like, spending as much time with our kids as we can. Learning who they are and helping them become who they will be. and I've realized that making sure I update a blog regularly or have all of the dishes washed or attended every library program isn't really needful. So, I may post updates or I may not. In the end it's not that big of a deal. As Willy Wonka said, "Time is a precious thing. Never waste it." Thanksgiving was great, the food was good and so was the weather. This was Grandpa's idea of a fun game for the boys- he called it the courage test. A seat on wheels with nothing for the passenger to hold onto. That water was freezing cold. But the fire was going inside so they warmed up quick. Speaking of quick, somebody has gone from scooting to crawling to climbing in a matter of weeks. Even without the bench she managed to swipe a few low hung ornaments. Clever and very determined this daughter of ours. 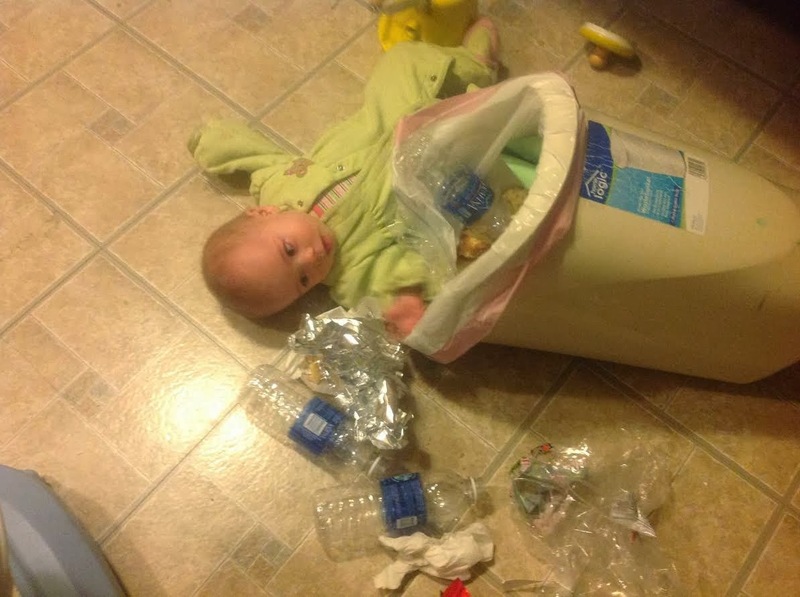 After days of trying she finally managed to climb up and rifle through the trash. I had emptied it just a few hours before so it was pretty light- down the little conqueror went! The picnic table has been her favorite challenge. The big kid food...she almost got some last night but has knocked over more than a few cups. We have been doing all sorts of fun Christmas crafts this month. We made very easy "snow" that was fluffy and cool to the touch. Directions found here. What fun is snow without a snow ball fight! Thanks Nathan for being so much like your mom! Another day we made Christmas cookies for all of our friends in Sunday School. The boys used holiday stamps to decorate the cards we attached. Then we headed out the next morning to make deliveries and wish everyone a Merry Christmas. When I saw a tutorial for Borax Snowflakes I had to try it. I have made the sugar ones but those take days which is not good for little ones. These were easy to do, only needed two ingredients and a few materials and just one day to form and then a few hours to dry. We attached hooks and hung them on the tree. They sparkle so beautifully with the white lights turned on. Today after lunch we made another snowflake. Fold a flour tortilla in quarters and cut shapes out with a clean pair of scissors. Unfold, brush with melted butter, sprinkle with cinnamon and sugar and then bake for a few minutes until crispy. Yum! Just a few days until Thanksgiving. The boys are excited...mostly because they get to eat pie and the fact that Christmas comes when Thanksgiving goes. They're kids. We took the boys to see that movie Free Birds and they loved it and were all excited about Thanksgiving until Matt came home with our turkey. The boys were coloring at the table and then stopped when they heard that the giant package we had just put in the freezer was a turkey. Nathan declared that he wasn't going to eat his birdie friend and Tim wanted to know what was wrong with us that we would want to eat a disgusting animal. Matt is excited to be handling the turkey this year. He's going to fry it. Nana is afraid that he is going to burn the house down so she invited him to come early and fry it in the backyard. Our memory verse in school last week and this week (Mon and Tues) is Psalm 136:1. After we practice our verse and talk about what we are thankful for on that day we do a small craft and then get started on the book work. Madeline isn't the only one reaching some milestones. This week in school I combined some of the letters that Timothy has learned into two and three letter words and wrote them down on index cards. We practiced sounding them out and "connecting" all of the sounds to read the word and Timothy is really getting the hang of it. I had anticipated it taking longer but he is such a quick learner! Also in the video is Nathan hollering for "little cuties". We bought a case of those mini oranges and he has been begging for them ever since they went into the basket.